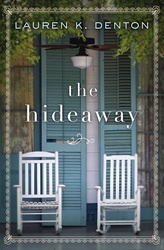 After her last remaining family member dies, Sara Jenkins goes home to The Hideaway, her grandmother Mags' ramshackle B&B in Sweet Bay, Alabama. Rather than hurrying back to New Orleans, Sara discovers a box Mags left in the attic with clues to a life Sara never imagined for her grandmother. With help from her grandmother's friends, Sara begins to piece together the mysterious life of bravery, passion, and choices that changed Mags' destiny in both marvelous and devastating ways. When an opportunistic land developer threatens to seize The Hideaway, Sara is forced to make a choice: stay in Sweet Bay and fight for the house and the people she's grown to love or leave again and return to her successful but solitary life in New Orleans. Born and raised in Mobile, Alabama, Lauren K. Denton now lives with her husband and two daughters in Homewood, just outside Birmingham. In addition to her fiction, she writes a monthly newspaper column about life, faith, and how funny (and hard) it is to be a parent.